Glee Season 6 will focus on a core group of characters and take the action away from New York City. 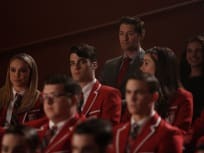 On Glee Season 6 Episode 3, Becky introduces her new boyfriend to Sue while Rachel and Kurt work as co-directors to rebuild the glee club at McKinley. Puck, Quinn, Santana, Mercedes, Brittany, Artie and Tina head back to Ohio for Homecoming on Glee Season 6 Episode 2. They help recruit students for the choir.